Frances - are you the middle girl in this photo? 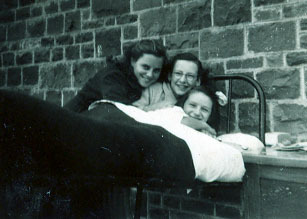 the one in bed is me (Ann) and the girl standing next to you is Mair. I was checking out my blog the other day when I came across this comment from Frances Purcell. "I could not make the Exhibition. I was a patient in Ward 2 at Craig-y-Nos Hospital from 1953 – 1954 The girls called me Percy because my Maiden name was Frances Purcell. I would love to hear from anyone remembers me or would like to write to me? If so. you are very welcome to write to me at my email address: francis.heenan@ntlworld.co.uk I very much look forward to hearing from any of you. Kind reagard, Frances "